Started by Daniel Leuck Dec 17, 2009. Started by Ken Berkun Sep 21, 2009. Started by Brooke Fujita. Last reply by Joe Segal Apr 20, 2009. You need to be a member of Crypto & Security to add comments! Stanford has a new online open-to-the-public crypto class that looks really interesting! Never mind. Further research reveals that what I just re-invented is essentially the Shamir Three-Pass Protocol originally developed in 1980. 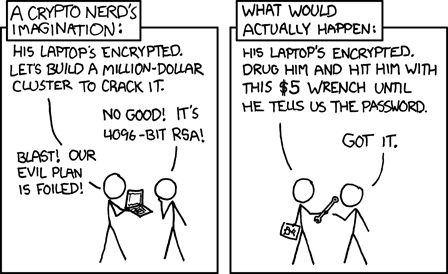 I was looking into the classic XOR method of encrypting data for transfer and it occurred to me that there is actually a way to use that method but without the need to share the key between the sender and recipient. I wrote up a little program to verify the idea, and it does indeed work. Now, maybe this is already a tried and true approach, but I haven't come across anything about it on the Internet. So, is there any member of the Crypto & Security group who would be willing to take a look at my approach and let me know whether or not it seems viable? Interesting article on a new Google project: Google Native Client. Secure desktop apps but all over the web?? Brooke: Regarding writing the enigma machine in GWT, I wonder: are script tags allowed? Hey Brooke - I love that the description of the group is encoded :-) I see from your ROT13 widget you are getting into Laszlo. Thats great!